via CTfastrak takes riders for a spin along bus rapid transit route – News – West Hartford News. I usually scoff when I see a statement like that because it has rarely been true. At best, new transit “bends the curve” meaning that while the new facility doesn’t cut congestion along corridor, it may well slow the rate of growth in congestion. And that’s a fine thing. But as I started to post this, I realized that this may now be true. Why? 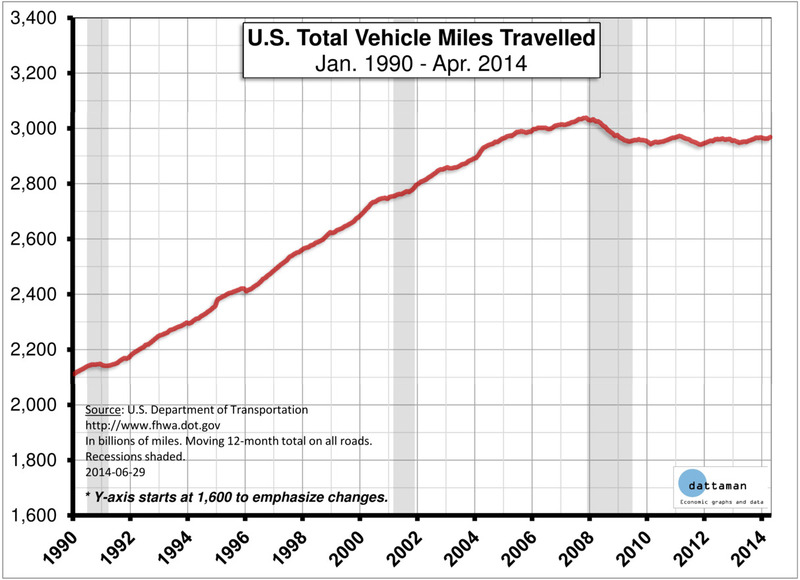 It’s in the article itself – VMT has at least leveled and may well be dropping. The chart below shows what’s going on. I really need to find or make a chart like this that goes back to 1945, because this is the first time there has been a sustained leveling of growth since WW2. And many, many, many facets of urban and transportation planning are predicated on that growth continuing indefinitely.